Anita Claire Jones, 82, of Harvard, passed away Sunday, March 17, 2019, surrounded by her loving family and friends. She was born October 30, 1936, in Harvard to William Clayton and Mildred Wells Sr. Anita married David J. Jones on March 1, 1958. He preceded her in death on May 22, 2015. Anita worked as a custodian for 32 years at Washington School in Harvard. 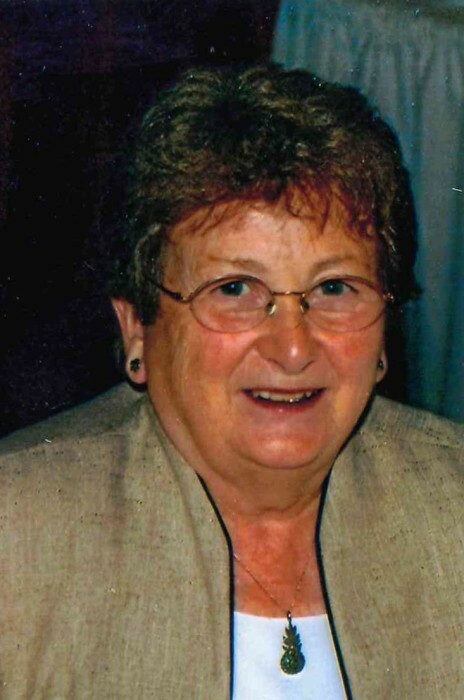 She enjoyed doing puzzles, watching the Chicago Cubs and Blackhawks and supporting her grandchildren’s interests. Anita will be remembered for her loving and giving nature. During the past few months, she enjoyed all the support and visits from family and friends. Survivors include her son David D. Jones; her daughter Pam L (Robert) Frost; her grandchildren Krista (Aaron) Starkey, Kurt Frost, and Tyler (Kiersten McLennan) Frost; one great-grandchild Everett Starkey; brothers William Edwin, and Delbert Wells; and many nieces and nephews. She was preceded in death by her parents, husband, sisters-in-law Barbara and Nancy Wells; brothers-in-law Albert and Walter Jones. Visitation will be from 11-1:00 p.m. Thursday, March 21, 2019, at Saunders & McFarlin Funeral Home, 107 W. Sumner St Harvard, IL 60033. Funeral services will follow at 1:00 p.m. Interment will be in Dunham-Chemung Cemetery.